First, let's consider cursors and how OneTouch makes them so much easier to configure. For one thing, OneTouch makes cursors much easier to grab and move due to an expanded touch area around the cursor compared with older versions of MAUI. 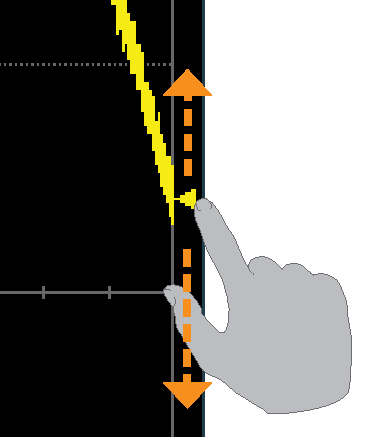 To change a cursor's measurement time/level, simply touch and hold it, and drag it to the desired position (Figure 1). Often, changes to the horizontal timebase will drive one's horizontal cursors off the display on zoom traces or other calculated traces. Prior to OneTouch, retrieving and repositioning them was a bit more involved. But with OneTouch, it's a snap. Drag the cursor readout from the Timebase descriptor at the bottom right corner of the display to the spot on the grid where you want the cursor (Figure 2). The cursors are set at either the 5 (center) or 2.5 and 7.5 positions of the grid. Cursors on the source traces will adjust their positions accordingly. 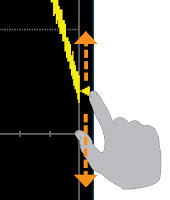 Changing triggers with OneTouch is also a matter of dragging and dropping the Trigger Level indicator, which is the yellow triangle on the right edge of the grid, to the desired position on the Y axis (Figure 3). The Trigger descriptor box will then display the new trigger level. If you'd like to change the trigger source channel. drag and drop the desired Channel descriptor box (Cx) onto the Trigger descriptor box. The trigger will revert to the last trigger set on that channel. 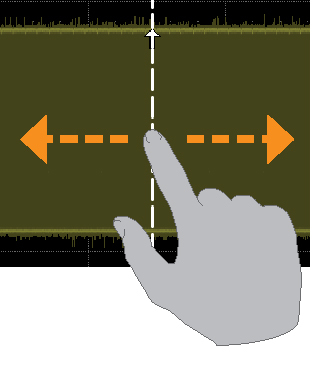 The intuitive nature of OneTouch gesture control is evident in other touchscreen gestures. For example, storing a trace to an internal memory is a matter of dragging and dropping the trace's descriptor box onto the target memory descriptor box (Mx). You can move a trace to a different grid by dragging it over to the desired grid. 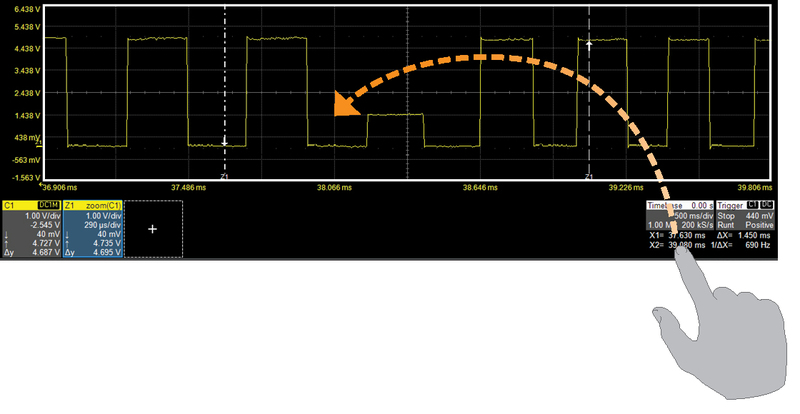 To pan through a trace, activate it to bring it to the foreground, and drag the waveform left/right or up/down. If a given trace is the source of any other trace, that trace will move as well. Need to pan faster? Just swipe the trace right/left or up/down instead of dragging. Creating a zoom trace requires drawing a box on the touchscreen around the portion of a trace you'd like to zoom in on. Either a finger or stylus will do. Doing so will open a new grid with the zoom trace (Zx) as well as a corresponding descriptor box you can touch to access zoom-factor controls. You can also pinch-zoom in or out with two fingers on any open trace. Want to get rid of a trace? Flick its descriptor box down off the screen. Gone.You can turn off a measurement parameter or a pass/fail qualifier in the same fashion by flicking the unwanted cell down out of the appropriate table. If it's the last item in the table, the table closes too. 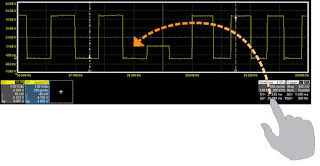 In the four posts comprising this series, we've shown how the oscilloscope UI is evolving into more than just the means of controlling the instrument. Rather, it's becoming a partner in creativity and innovation.